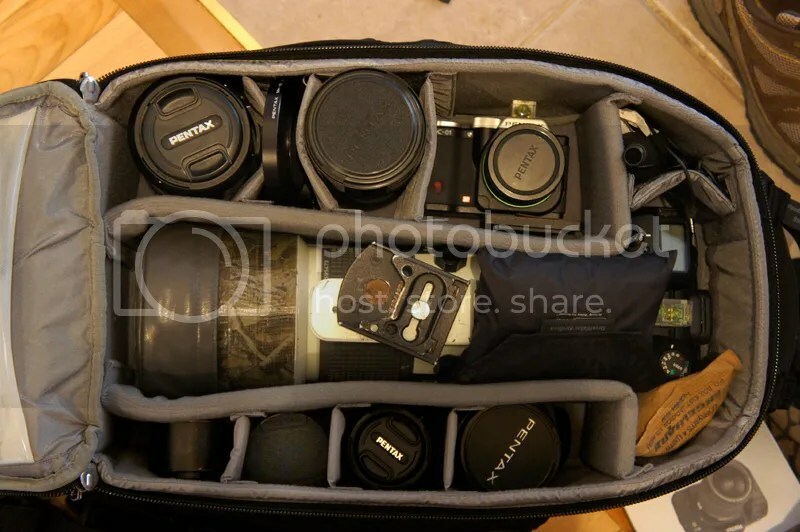 Think Tank StreetWalker Hard Drive camera bag. After several years of using my Lowepro Mini-Trekker (around 12 years), my equipment grew up in number and size, my old Lowepro was beginning to fall apart and i couldn’t carry all the lenses i wanted. I visited many wild areas and took many shots with the equipment i carried into it but it was time to replace it. After reading reviews and opinions on the internet i decided it was time to go to the store and try some bags with my equipment. There is a big camera store in Montreal, which is a 30 minutes drive from my home and they have a large selection of bags. The thing that i wanted in my new bag was that my K20D attached to my Pentax-67 M*400mm/4 would fit so that it’s always ready when a subject appears. In my Lowepro Mini-Trekker the 400mm with the K-mount adapter attached was barely fitting and my K20D was alone with no lens attached, not a quick way to react when a deer or a bird is in my lens range! After trying my equipment in some bags and putting them on my back i finally decided for the Think Tank Streetwalker Hard Drive bag. The bag feels solid and well made and comes with a very good guarantee. All the equipment i want to carry with me fit in the bag and is comfortable when adjusted. I have now used it in the field and i’m still very pleased with my choice, i have yet to try it in the rain. When i will have more experience with it in the field i will post an update. DA*50-135/2.8, K200/2.5, K-01 with DA35 Macro Ltd. In the middle: Pentax-67 M*400m/4 with K20D. Bottom: Extension tubes and TC 1.4X-S, FA20/2.8, DFA100 Macro WR, DA14/2.8. This entry was posted on July 18, 2012 by Steeve Marcoux. It was filed under Equipment and was tagged with extension tubes, lowepro mini trekker, pentax 67.